06 Feb 2019 --- New research has been carried out that helps solve the growing problem of honey bee pollinators and their offspring dying while they migrate to the US West Coast during the almond blossoming season. Every winter there is a mass migration of honey bees to California which helps pollinate the Central Valley's trees responsible for more than 80 percent of the world’s almonds. But, in recent years more bees and larvae were dying and nobody was exactly sure why – until now. With support from the Almond Board of California (ABC) as part of a package of measures the industry is taking to improve practices in the almond growing sector, bee expert and Associate Professor of Entomology, Reed Johnson of The Ohio State University took up the task of figuring out what was happening. 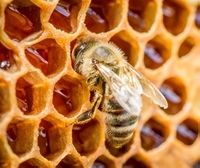 Earlier research had shown that some insecticides thought safe for bees were impacting larvae. The problem started in adults only and beekeepers were most worried about the loss of queens. In 2014, about 80,000 colonies – about 5 percent of bees brought in for pollination – experienced adult bee deaths or a dead and deformed brood. Some entire colonies died. Johnson and his research team were able to identify the chemicals commonly used in the almond groves during bloom because of California's robust and detailed system for tracking pesticide applications. They later laboratory tested combinations of these chemicals on honeybees and larvae. In the most extreme cases, combinations decreased the survival of larvae by more than 60 percent when compared to a control group of larvae unexposed to fungicides and insecticides. The recommendation is being promoted through a wide array of presentations by almond industry leaders, beekeepers and other experts and has been included in the Almond Board's honey bee management practices. Many almond growers are rethinking their previous practices and are curbing insecticide use during almond bloom, according to Johnson. “I was surprised and even the experts in California were surprised that they were using insecticides during pollination,” Johnson adds. While these products were considered “bee-safe,” that was based on tests with adult bees that hadn't looked into the impact they had on larvae. The process of spraying is labor-intensive which is why many growers choose to double up and may have been looking to maximize their investment, Johnson notes. This research could open the door to more studies of fungicide and pesticide use on other bee-dependent crops, including pumpkins and cucumbers. To further protect almond orchards, employees and communities, by 2025, the Californian industry has committed to increasing adoption of environmentally-friendly pest management tools by 25 percent. Responsible almond farming requires protecting the crop and trees from bugs, weeds and disease through an integrated pest management approach. This means using tools and techniques like beneficial insects, habitat removal, mating disruption and, when necessary, pesticides. “We have been working with innovative pest management for quite a long time and this has been cited by the US Environmental Protection Agency for several years in terms of the efforts being made. But it is a constant evolution to reduce chemical use and to substitute that with non-chemical tools,” ABC President and CEO Richard Waycott told FoodIngredientsFirst during an in-depth interview last month. You can read more on this here.